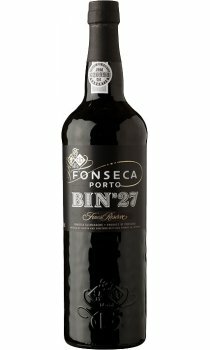 Fonseca Bin No27 was created over a century ago for family consumption, and only released commercially in 1972. It is produced primarily from wines from Fonseca's own quintas in the Cima Corgo and thus shows an exceptional quality and consistency from year to year. Blended from reserve wines selected for their superb fruit character and depth of colour, it's well-knit structure, rich, velvety full body and luscious blackcurrant and cherry flavours, also dominant in the bouquet, finish on an intense, lingering note.